The VLAD is a small wave destroyer. We created it with a fuller curvy outline than what you find on comp style shortboards so that it catches waves easily and glides in lack luster surf. We keep some of that width through to around the last 12” of the board for extra help in creating and maintaining speed in slower sections. As the tail starts to narrow, we reduce the tail area down with a winged swallow to give it sensitivity and ease of performance at any speed. Those wings work in conjunction with the swallow tail by creating pivot points and bite for tight turns and controlling speed when needed or if pushing the board into bigger steeper waves. White Diamond style rockers make the VLAD scary fast and adds to its wave catching powers. Some flip is added to the nose for making steep drops and attacking vertical sections. And medium rails shaped with a hard tucked edge in the tail area give the VLAD a performance feel when generating speed and flying through turns. Designed for speed like the rest of the board, the bottom contours add lift plus predictability. For anyone that dares, the VLAD rises to strike at will and rip through waves, none are to be spared. Medium for stability with tucked hard edges in the tail for speed and hold. Deep single to slight double concave with vee out the tail. Five fin is standard to ride as a twin, thruster or quad. Can be ordered custom with Twonzer fin setup and fins. Knee high to a couple feet overhead beach, point and reef breaks. 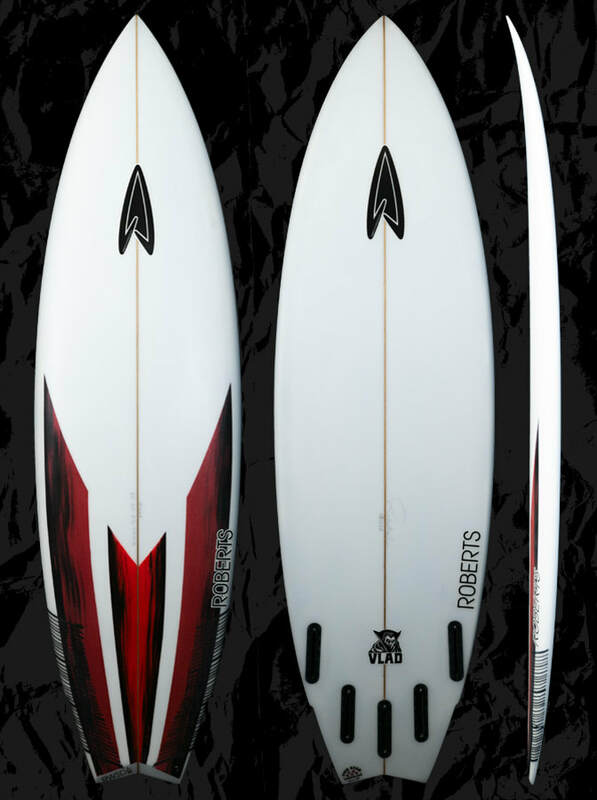 Sized compared to pro model shortboards go 5-6 inches shorter, 1" wider and in the same thickness. 1-4" shorter than your height for high performance approach, matching volume to skill level, needs, or preferences. Up in volume and at your height or beyond for additional stability and wave catching ease. Custom dims are always available. Custom dims are always available. Please feel free to use our CONTACT US form to receive more info about our boards and sizing.